Rubenerd: Harold Nolte’s DOS nostaliga quiz! Harold Nolte’s DOS nostaliga quiz! How much do you remember about DOS? Mr Nolte on Twitter sent me a link to an article of his on Examiner.com where you can test your DOS knowledge! I scored 9 out of 10 (I fudged the very first question!) which given I was born in 1986 and used our first DOS machine when I was 4, I reckon is not too bad of an effort. I guess it's true what they say, you learn more when you're young than you do at any other point in your life. These are the questions, if you think you know the answers go ahead to Harold's article and choose the right multiple choice answers! When was MS-DOS first introduced? On which operating system was DOS directly based? Which command is used to clear the screen? What key(s) do you use to exit a program? What is the command ATTRIB used for? What would you type to see files and folders? What is the beginning folder for all DOS paths? Which program did not run in DOS? I loved that old computer; we had PC-DOS 4.x I believe, followed by MS-DOS 5.0 and Windows 3.0 with Multimedia Extensions, then a few years later we got MS-DOS 6.22 to use with Windows 3.1 in 386 Enhanced Mode (it was a 486SX!) so we could use the drive compression. We had Windows 95 on it briefly, but we really didn't have enough RAM to use it properly. As for DOS applications, before we had Windows we used XTreeGold (Wikipedia) as our de facto shell, then we relegated that to just file management when we got a shareware copy of PowerMenu by Brown Bag Software. I wonder if either of those or the companies that made them are still around? 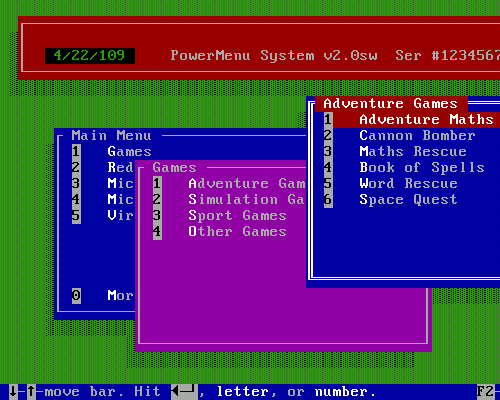 A cursory Google search turned up plenty of results for products called PowerMenu but none were the same. And of course it goes without saying that Commander Keen is the greatest game of all time! Come to think of it… I could write a pile of posts about this stuff! Is "pile" the correct collective noun for "stuff"?